At the University of Groningen in the Netherlands scientist can now use our new enormous multitouch screen. 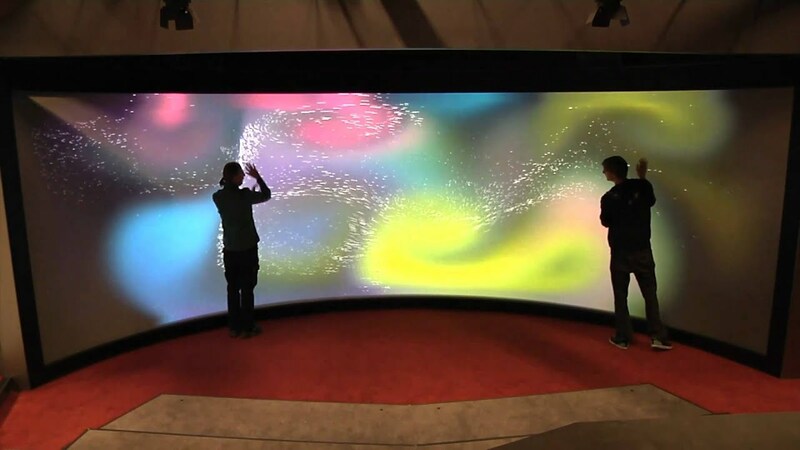 What happened is that we turned our existing 3D theatre with a big cylindrical screen into one that can detect 100+ simultaneous touches. We mostly used off-the-shelf hardware components and public domain software. Apparently size does matter and the result is really impressive. Have a look at this youtube movie to see how big an fast it is. What makes this screen special is its size and the fact that it is a transparent curved screen. The curvature is nice to have because it enhances the feeling of presence. A virtual reality experience is much more intense with such a screen. The disadvantage is that many of the techniques used for detecting touches are hard to implement in such a setup. After some initial testing we decided to use the diffuse illumination method using six cameras and sixteen infrared illuminators (the kind that is used for security purposes). The cameras, illuminators and projectors are all placed behind the screen. Due to the diffuse layer on the front side of the screen, the cameras cannot see clearly through the screen, however whenever someone touches the screen, enough of the infrared light is reflected back to see the tip of the finger. The difference is very small (on a scale of 0-255 the difference is only 2 or 3), but still big enough to be seen by the computers that analyse the images from the cameras. Now we have such a touch screen we can use it for driving our existing software, but the initial goal was to facilitate the scientists studying Geographic Information Systems and a research group that studies interaction methods for touch screens. Having such a huge screen changes the way people interact with data and with each other. They could easily work on part of the screen in their own little environment but could switch very fast to a more collaborative approach. Last modified: 12 October 2017 11.55 a.m.